The mosque that was commonly used by the Promised Messiahas was Masjid Aqsa in Qadian. Since this mosque was already in place, Masjid Mubarak was the first mosque to be inaugurated, built and established by the Promised Messiahas. But first, let’s take a quick glance at Masjid Aqsa of Qadian. The Promised Messiahas, in Kitab-ul-Bariyya, mentions how the building of Masjid Aqsa was initiated by his father, Hazrat Mirza Ghulam Murtaza (Chief of Qadian). Huzooras narrates that his father had gone into a feeling of deep remorse on having spent his entire life in worldly pursuits. 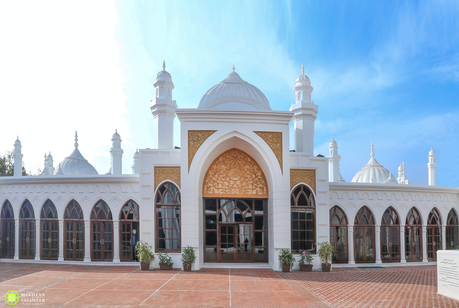 To find peace of heart, he thought of having a mosque built next to his house, where he could hear the call to prayers five times a day, and not only offer prayers himself but also provide this great amenity to the local Muslims too. The piece of land that he purchased in an auction was formerly a prison, once managed by the Sikhs (Sheikh Nur Ahmad, Mukhtar-i-Aam [Attorney] in Al Hakam, 14 January 1936). Some traditions suggest that this piece of land had once been the local court of law of the Sikh rulers (Sufi Ghulam Muhammad Sahibra, Register Riwayat, Vol 7). However, Hazrat Mirza Ghulam Murtaza purchased this plot of land and the task of building a mosque began in 1875. The mosque is said to have become functional by 1876, but Hazrat Mirza Ghulam Murtaza had by then, unfortunately, passed away. The Promised Messiahas was a regular worshipper at this newly built mosque. A Pandit Devi Ram was posted as a teacher in a local school of Qadian in 1875. He witnessed, and reported, that Hazrat Mirza Ghulam Ahmad would walk through a narrow street from his house to the Aqsa Mosque and offer his prayers. He would usually be alone, but when joined by Mirza Kamaluddin or Mir Abid Ali (two local Muslim residents of Qadian), they would offer prayers in congregation. Otherwise [Hazrat] Mirza Sahibas would offer his prayers and return. Pandit Devi Ram narrates that the Muslims of Qadian were generally uninterested in religious affairs and the majority would find ample time for gambling and other vain activities. When the Promised Messiahas started the great jihad of the pen and wrote great scholarly works like Barahin-i-Ahmadiyya, he felt the need to have a mosque near his house so that no time was lost; not even the few minutes that were occupied by the walk to and from Masjid Aqsa. It was with this intention that Hazrat Mirza Ghulam Ahmadas initiated the building of a mosque right next to Bait-ul-Fikr – a room in his house where he produced great works like Barahin-i-Ahmadiyya. Hazrat Sheikh Yaqub Ali Irfanira (Editor Al Hakam Urdu) reported that the construction work started in 1883, however Hazrat Pir Sirajul Haq Numanira dated it to 1882. The Promised Messiahas arranged for timber from some trees of his orchard and a frame was prepared by the southern wall of his house, just by Bait-ul-Fikr. Bricks were obtained from the foundations of a rundown, redundant ruin of a building. A builder, namely Piran Ditta, started the construction work. Huzoor’sas entrance was made through the wall of Bait-ul-Fikr but the steps – for outsiders to enter the mosque – were built on 30 August 1883. The interior of the mosque was ready to use on 9 October 1883 and the exterior was whitewashed later on. Thus, was built the first ever mosque of the Ahmadiyya Muslim Jamaat. Every Ahmadi can bear witness – hand on heart – that this humble beginning of the Ahmadiyya building scheme has given such beautiful fruits in the form of hundreds of mosques in every part of the world. With every continent of the world, and many countries of every continent having an Ahmadiyya mosque, we can proudly say that “The Sun Never Sets on the Ahmadiyya Muslim Jamaat”.